Yet another great result, and yet another comeback! An incredibly open game, in which both sides missed many chances (including a penalty). Liverpool created plenty of good chances – getting themselves into one-on-one situations on three occasions – but scored their only goal from a scruffy free-kick. Raul Meireles chips a ball in towards the corner of the 6-yard box. Spurs have six defenders against four Liverpool attackers.Martin Skrtel is the obvious target, and so Crouch is given a man-to-man job on him. Crouch is the player furthest forward in this shot and, as you can see (and can see much more clearly in the video, linked above), Skrtel gets a run on him, which is the easiest way to lose Crouch in these situations. Having made the run across Crouch, Skrtel easily gets to the flight of the ball first, and looks to head it back towards Kuyt, who is totally unmarked (left of the picture, having dropped off away from Bassong). 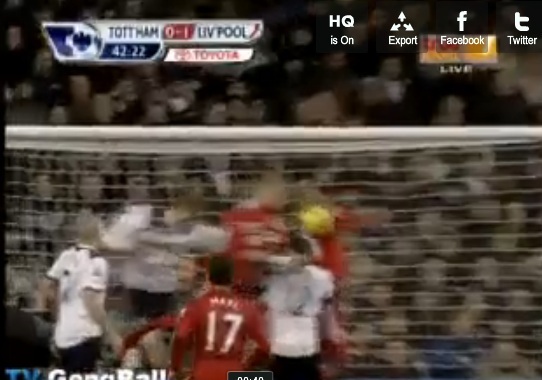 …and falls perfectly for Skrtel. Palacios is a little flat-footed in getting to it, but he does enough to make it difficult for Skrtel, as do Gallas and Bassong, who are in decent positions to make a block (more on them later). 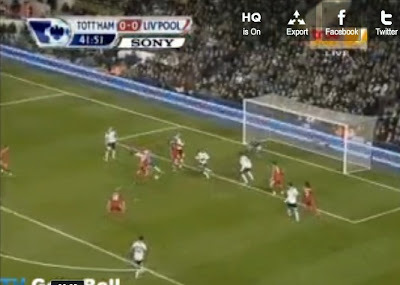 Skrtel is quick to react and, despite the defenders closing on him, he gets his shot away. It’s only a toe-poke, but it’s beyond Gomes before he can see it. Liverpool got a bit lucky with the the rebound, but it was a decent ball from Meireles, and Skrtel will argue that he made his own luck with his run across Crouch. From a defensive point of view, Crouch should be staying goal-side – he’s normally great at defending similar situations, but is usually asked to clear from a standing start, and he is vulnerable when players are able to run off him. If Liverpool had noticed this and planned accordingly, then fair play to them. 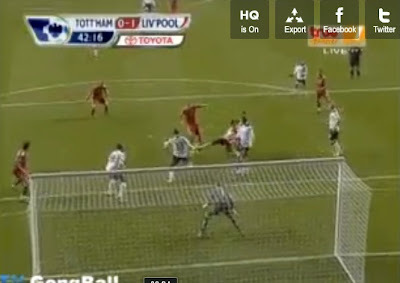 One thing also worth mentioning is the way in which Torres gets away from Gallas. Watch the video again, and focus solely on the Torres/Gallas battle. Torres’ movement is excellent, but Gallas, strangely if you as me, just lets him run, and expects Bassong to pick him up (leaving Kuyt free). 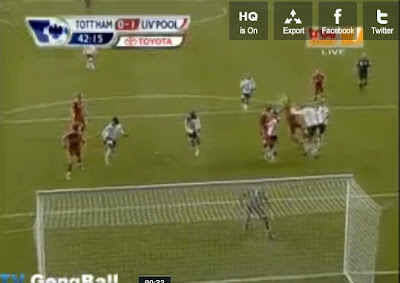 If the ball had fallen to Kuyt or Torres, I’d have been pointing the finger at Gallas. When did Redknap sign Atkinson? It didn't hit Nogs back......it hit his arm! We needed that goal. we can't start until they score. Serves them right they should have settled for 0-0. We often seem slow to react in such situations, nobody takes charge and puts the ball into the stands, we seem to hesitate and look at each other hopefully. Crouch is fine when the ball is hit high but hasn't the strength to come through the ruck as we see at the other end. Spot on, Jimmy - definitely some hesitation/ball watching in the ranks. Liverpool's goal came too easily. Frustrating stuff. Our fight back to win at the end was glorious, however, we need clean sheets in order for us to ensure we have a strong goal difference advantage at the end of the season. A lot of people are saying that Liverpool could have been 3 up at half-time and you also imply as much. In my opinion these people are ignoring the clear cut chances that we had before Liverpool scored. Modric had a clear, unopposed shooting opportunity early on, from Lennon's cut back, and failed to connect properly and Defoe also had an easier chance than Skrtel's but failed to convert. So, on balance, I thought that we were very worthy winners. One point about Skrtel's goal, if any of our defenders had shown the determination of Carragher, when blocking Defoe's effort, he might not have scored. Blocking shots is not a particular strength of ours, as demonstrated by our lack of clean sheets. The biggest error with this goal was the fact that they got the free kick. Bassong was, as he too often is, overly aggressive in his duel with Torres. This is a problem for Bassong, as well as for BAE. (In respect of the latter, the perfect example is the needless foul committed in the 95th minute, in a 50/50 situation in the middle of the park when in perfect balance). This aside, I think Bassong had a very good game, showing that we are actually very well covered at CB, despite the mountain of injuries. The same can not be said about the RB position, even though this was one of Hutton's better defensive performances. Finally, without any connection to this topic, what's the ironic cheers to Palacios all about?!! Not helping the plyer, nor the team. Disgraceful and well worthy of reprimands from the real fans. Hope it doesn't happen again. Ever! Anon @ 11:36 - I agree with you, I tweeted the same last week. Defoe's chance, and the penalty were as good as any chances that Liverpool had. optimistic spurs fan - hard to disagree with that. Bassong and Kaboul both tend to give away silly free kicks in dangerous areas.